The Special Economic Zone Authority in Duqm (SEZAD) today gave a presentation before Mizengo Kayanza Peter Pinda, Prime Minister of the United Republic of Tanzania. The presentation reviewed the investment opportunities available in the Zone and the projects that are being implemented at the present time, as well as the incentives and privileges provided by SEZAD for investors. Yahya bin Said Al Jabri, Chairman of SEZAD confirmed in a statement to Oman News Agency (ONA) that the presentation introduced the economic zone and the vision of His Majesty Sultan Qaboos Bin Said to this region. 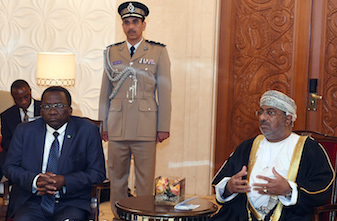 He added that the presentation highlighted the good relations between the Sultanate and Tanzania, pointing out that the two countries are working on the development of these relations to serve the interests of the two peoples. SEZAD Chairman in the presentation addressed the cooperation between the ports of the Sultanate in general and Duqm Port in particular, in addition to the Tanzanian ports, explaining that the Duqm Port can serve parts of Asia, as well as by virtue of its location can be an important strategic position from which cargo can reach East Africa. Saleh bin Hamoud Al Hassani, Director of One Stop Station at SEZAD provided a presentation about the Zone, the advantages of the geographic location, the incentives and facilities provided by SEZAD for investors. He also addressed the concept of one-stop station and the powers available to SEZAD with respect to the subject of business completion, in addition to the projects, bidding and the investment opportunities offered by SEZAD. The presentation also discussed the total private sector participation, whether international or local, in some independent projects in the Zone.